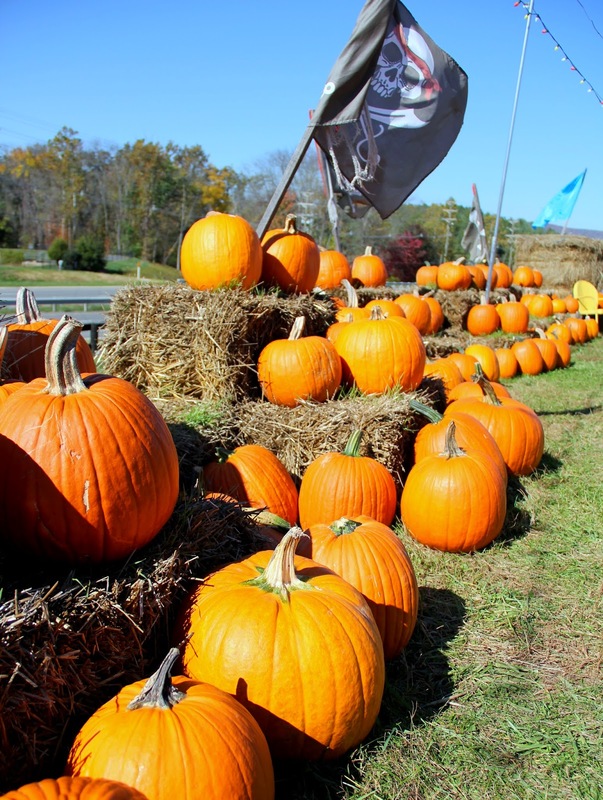 To say I've been looking forward to visiting a pumpkin patch with would be the understatement of the year. I have been dying to have this moment with Charlotte. 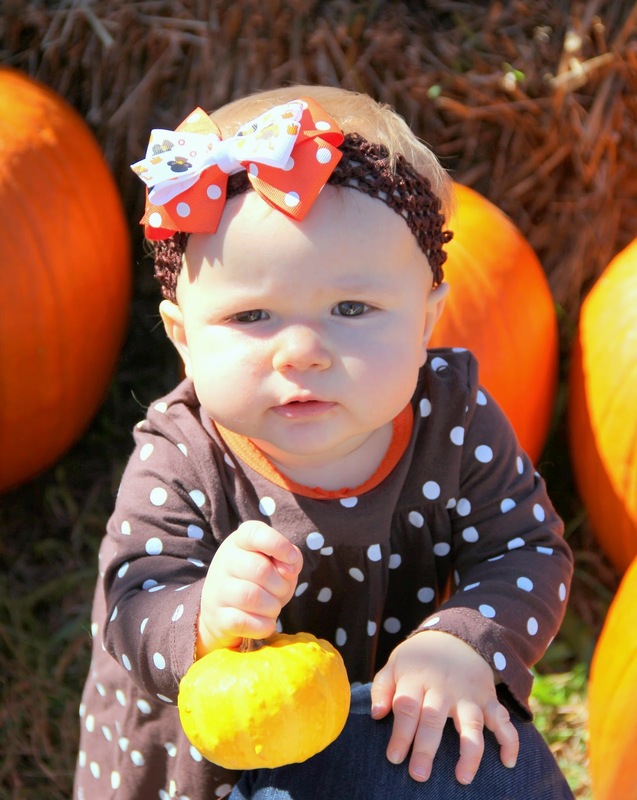 Halloween, Thanksgiving, Christmas and her first birthday all in the next 3 months is almost too much for my little heart to handle! 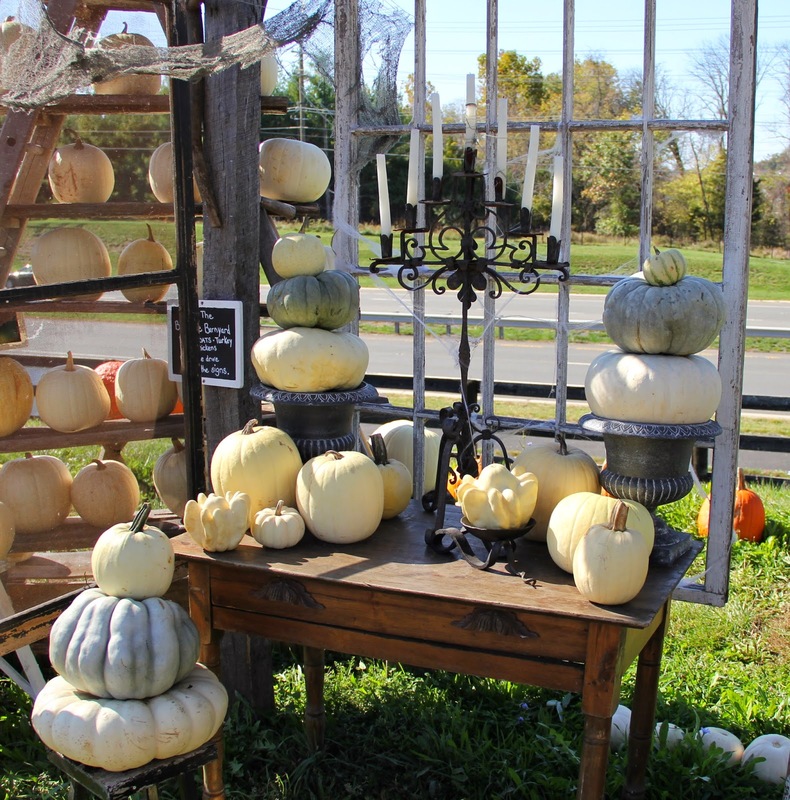 Our first stop on this three part journey was the pumpkin patch at Burnside Farms. Look how cute and pretty everything is? 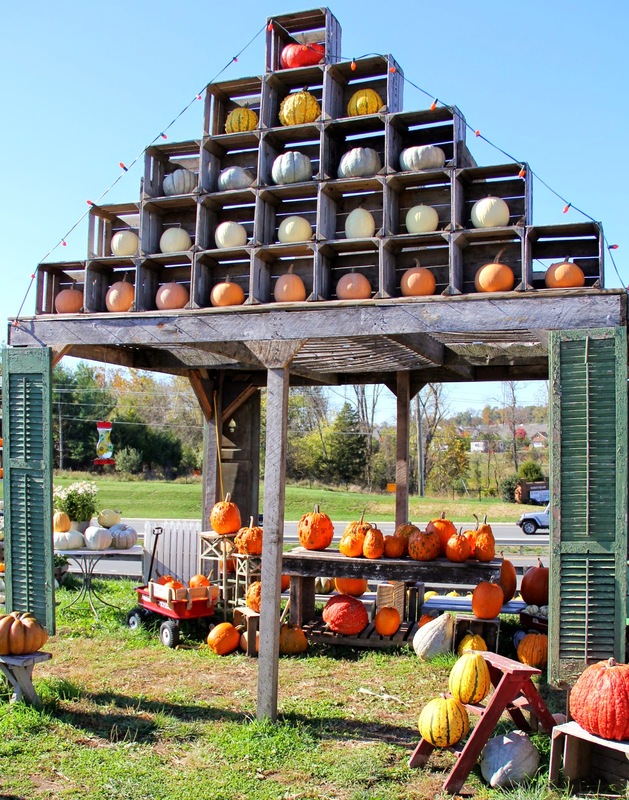 I love the mini market and all the scenes with the pumpkins. 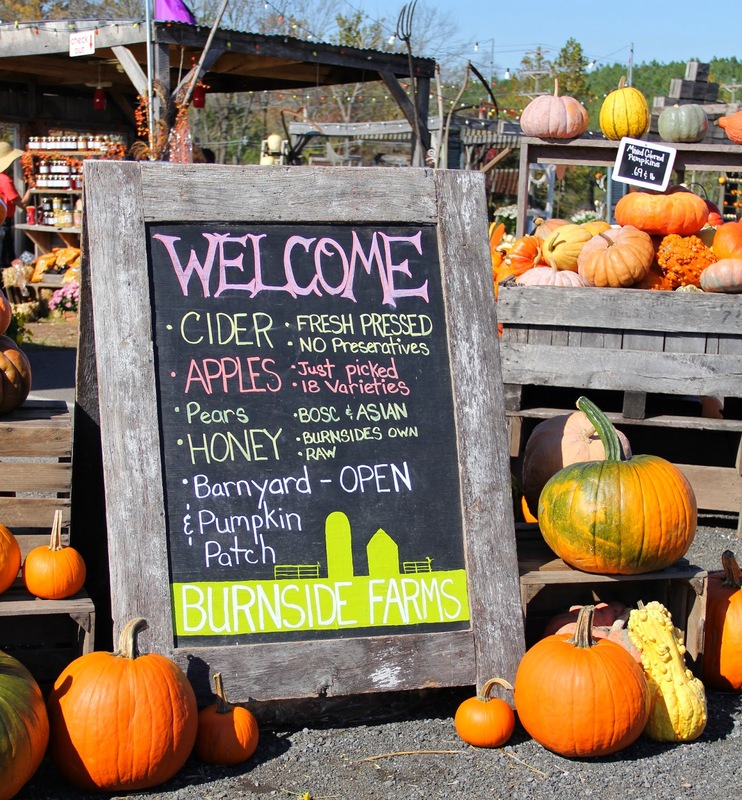 We chose to Burnside Farms over the other big fall festivals and pumpkin patches in the area mainly because they didn't charge admission. Since this was Charlotte's first visit, we knew we didn't need to spend money on activities and games she couldn't partake in. 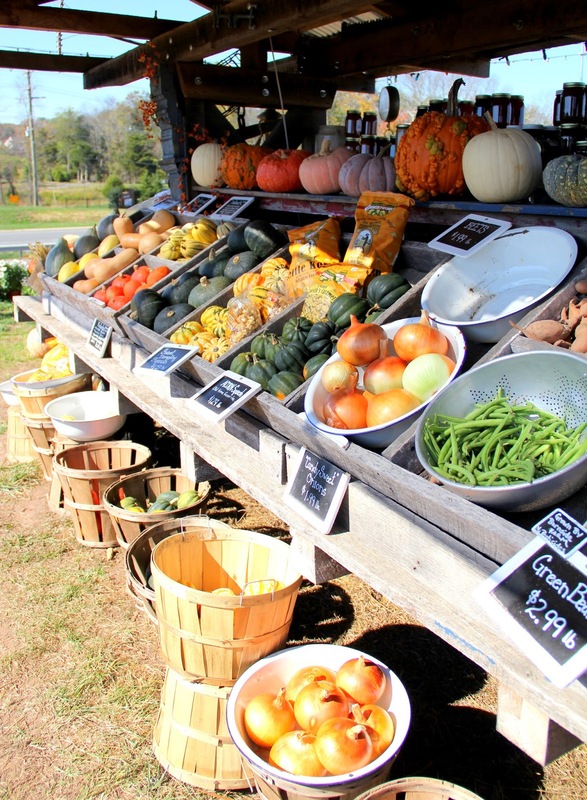 Plus, how can you resist this cute and quaint little farm?! 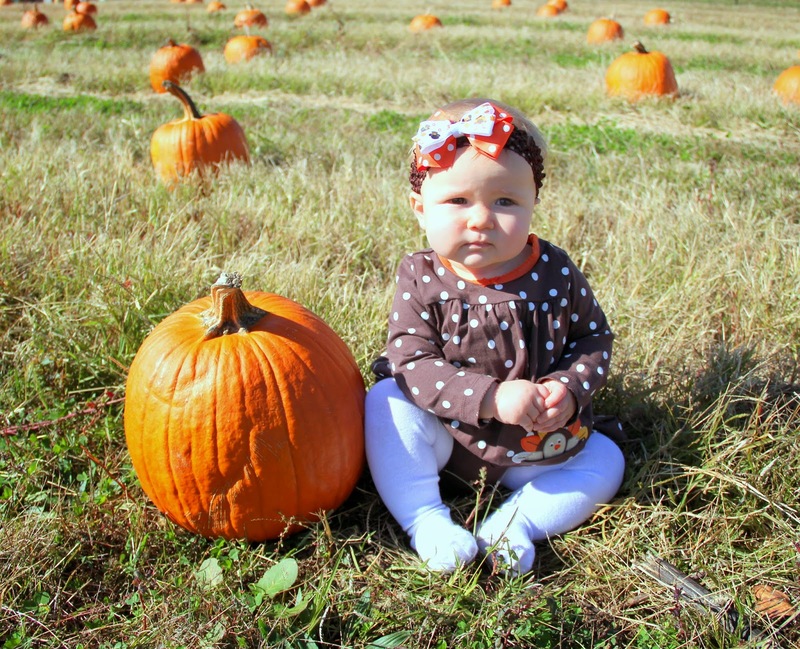 Charlotte was not at all a fan of posing next to this pumpkin. I don't know if it was the coarse grass or the foreign object next to her, but about 3 seconds after putting her down she completely lost it and demanded to be picked up. 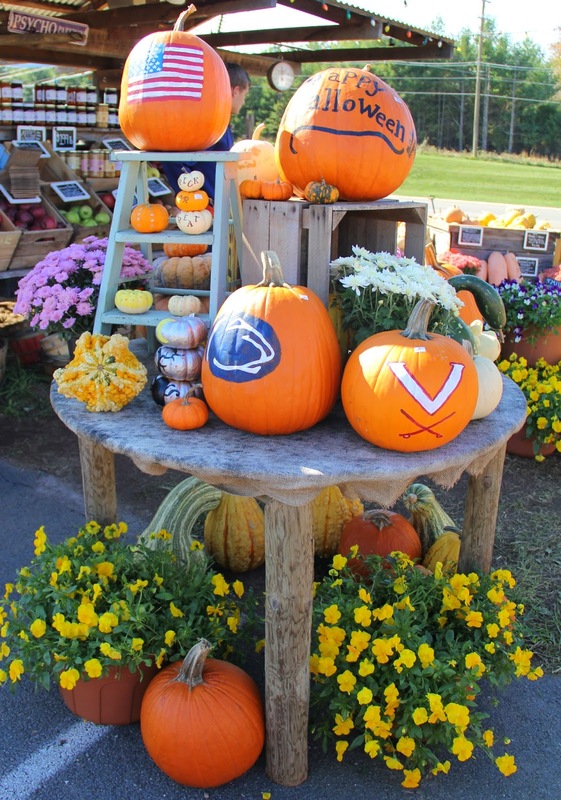 We tried again by the smaller pumpkins to see if that was less intimidating, but no such luck. The only way she would cooperate would be if I was holding her. 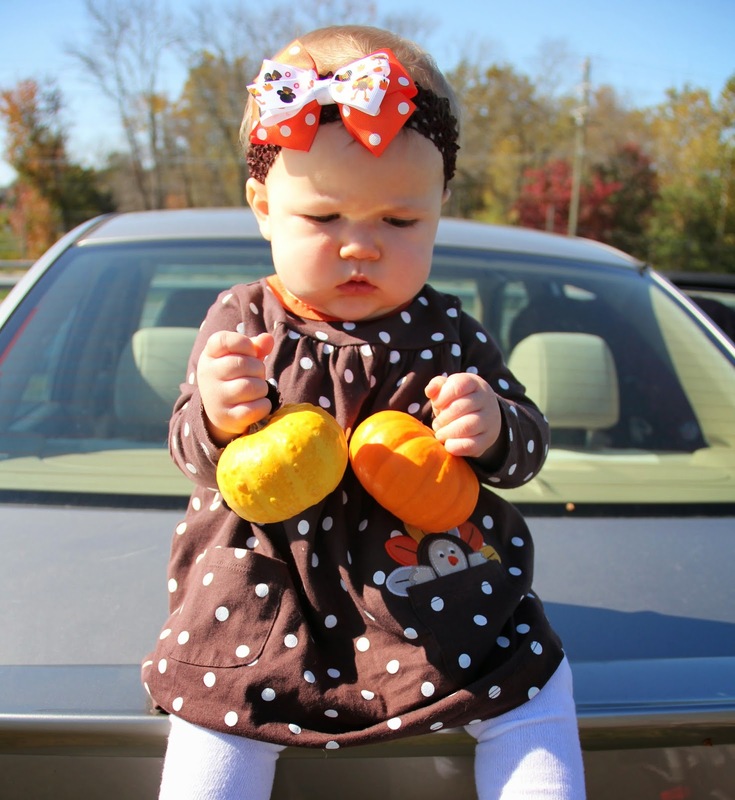 I did give her a mini pumpkin to play with so she would be less afraid of the larger ones. 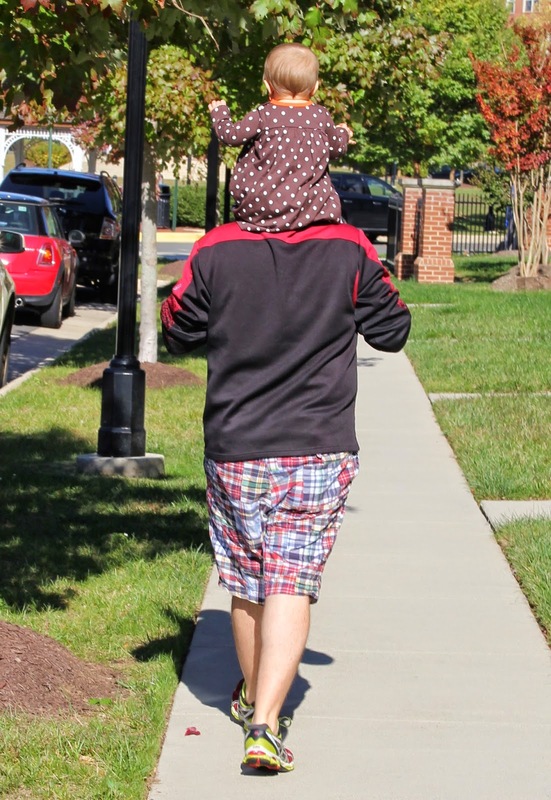 Even though the pumpkin experience was a little stressful for Charlotte, at the end of the day, all that mattered was that she had her Daddy to protect her from the scary pumpkins and hoist her up on his shoulders to carry her home. If you're anything like me, you have probably waited until the last minute to figure out Halloween costumes for your children. 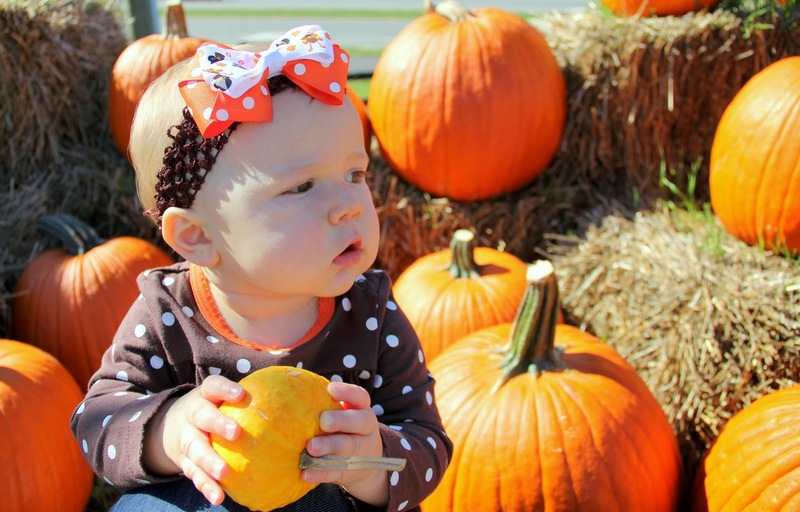 You would have thought since this is Charlotte's first Halloween, I would have had her costume figured out months ago...that couldn't be more wrong! 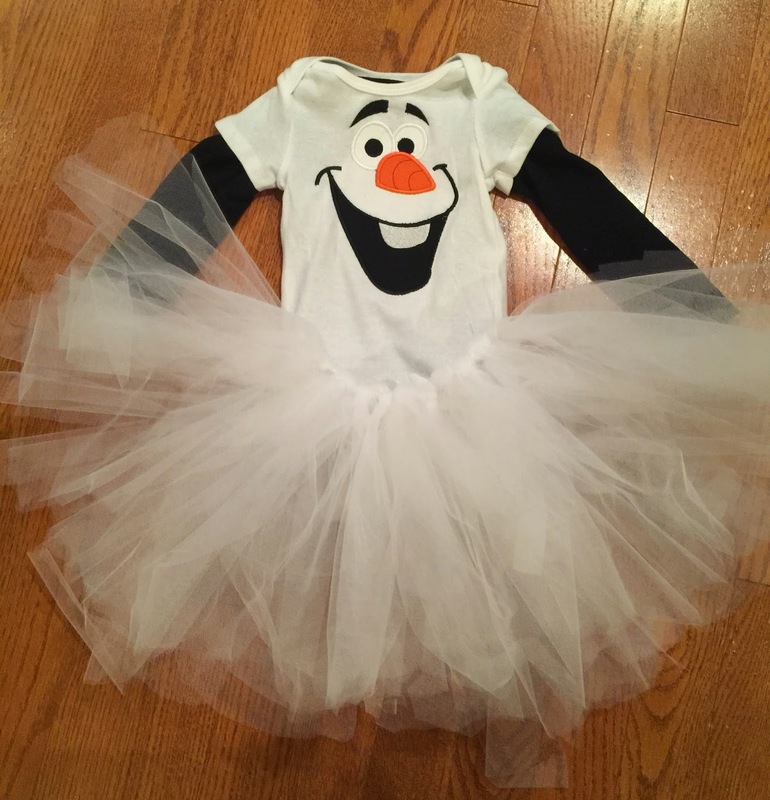 Last week a quick panic came over me when I realized I hadn't even thought about a Halloween costume and it was in just two weeks! 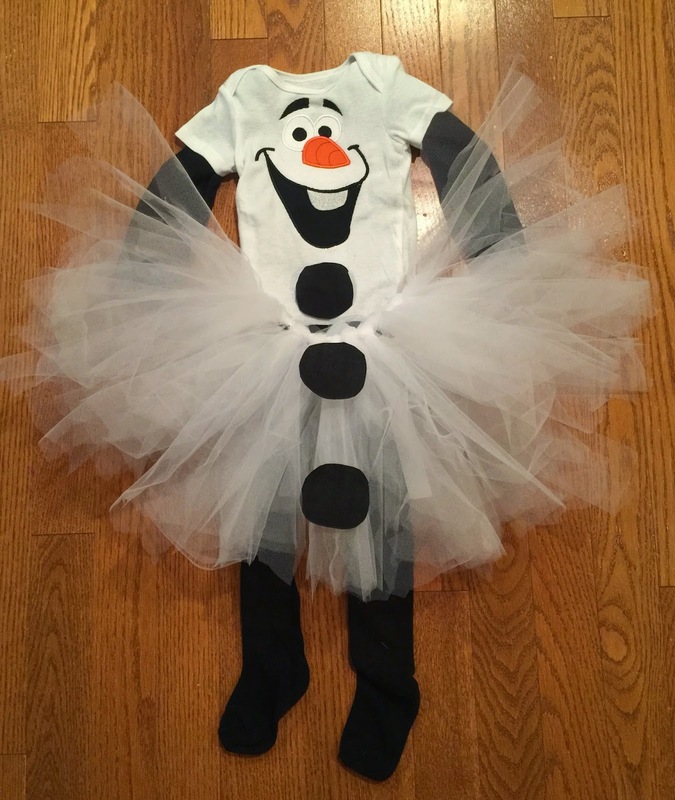 After a good Pinterest session, I decided on Olaf. Since Frozen is so hot right now (see what I did there?! ), I decided to ride that train while I can, because I'm sure by this time next year, no one will even know that lovable snowman's name. In an effort to not break the bank on a costume she will only wear for an hour or so, I decided I would try my hand at making it. After all, she isn't going to remember this Halloween and dressing her up is for pure selfish reasons on my part so the simpler the better. My only stipulation was to make sure it was cute enough for pictures! Making the skirt was my first step. I didn't bother doing a full tutorial on this, since there are already 1,000 of them out there. 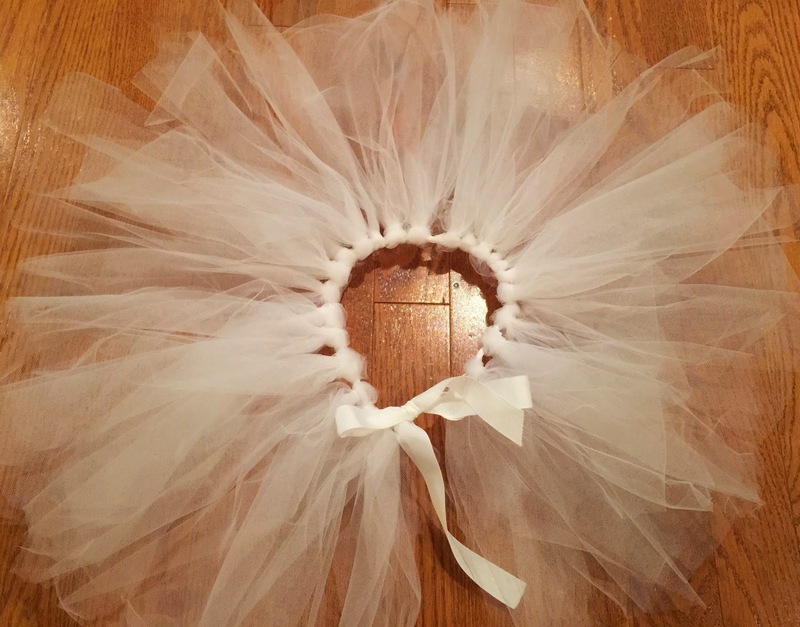 Here is the one I used for the tutu. This was super easy and doesn't require a sewing machine or any sewing skill so don't be afraid! 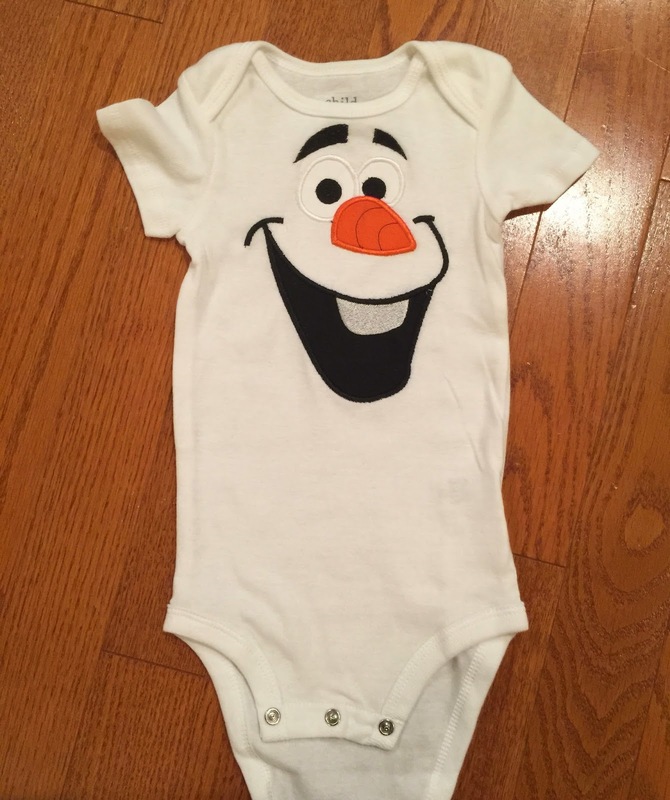 The next step was to make the onsie. I chose to do a short sleeve one because I wanted a black one sleeve shirt underneath so she had twig arms just like Olaf! I found an embroidery file that was an applique of Olaf's face, so I simply made the shirt that way. If you don't have an embroidery machine, his face is simple enough to make on your own. I would either hand draw his face directly on the onsie or cut out pieces of fabric and glue them on. Now for the final touches! Simply add black tights, black fabric circles to the tutu and your black long sleeve shirt, and that's all there is to it! I'm so proud that the only money I spent on this costume was to purchase the embroidery file for the shirt. Everything else I managed to have from leftover projects or were part of Charlotte's existing wardrobe. The only thing left is a head piece of some sort. I know Olaf doesn't wear a hat, but I was thinking about maybe a basic white bow with some pipe cleaners coming out the top like his hair. Let me know if you have a better idea. I would love to hear about it! 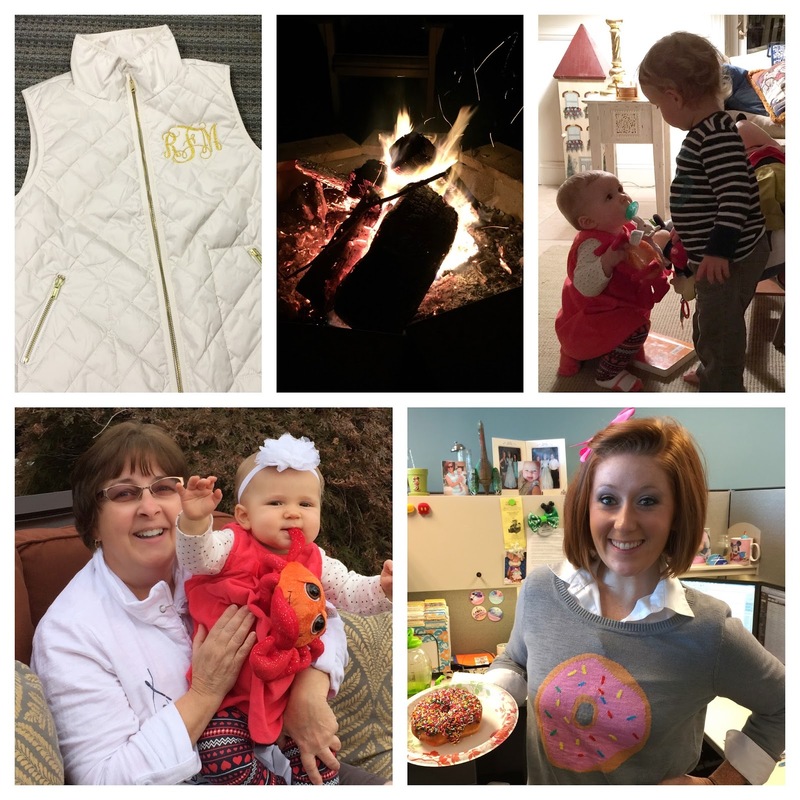 Monograms, monograms and more monograms. 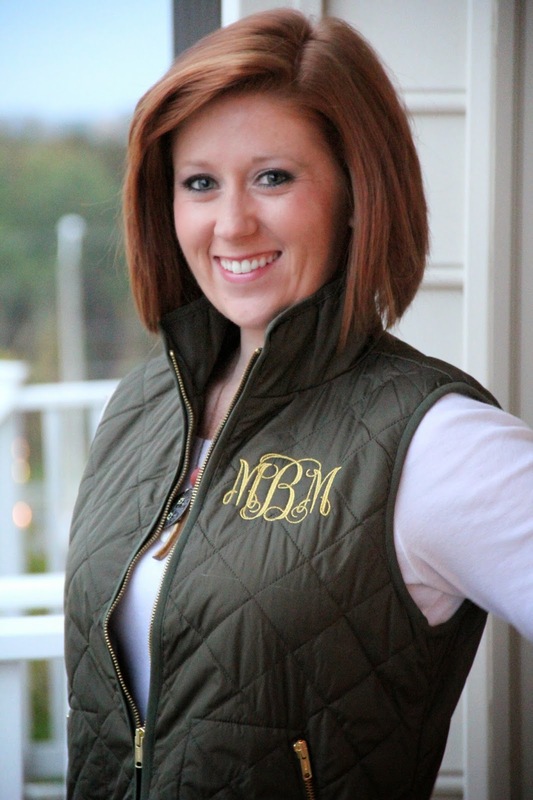 Who wants one of these awesome monogrammed vests?! Check my Instagram tonight for a flash sale of my entire inventory of vests! I will monogram and ship for $45! Who doesn't love a fire-pit on a nice cool fall night?! We spent some quality time with our family over the weekend and it's moments like this, under the stars with a warm fire and a drink in my hand that makes all my problems insignificant. Charlotte is already looking up to her older cousin. He is so sweet to her by making sure she has all her toys and books. We had so much fun celebrating my mother-in-law's birthday at Tides Inn. Charlotte got a special souvenir (the stuffed crab hanging from her mouth), and it hasn't left her sight since. We had donuts in the office yesterday, so of course I had to wear my matching donut sweater! 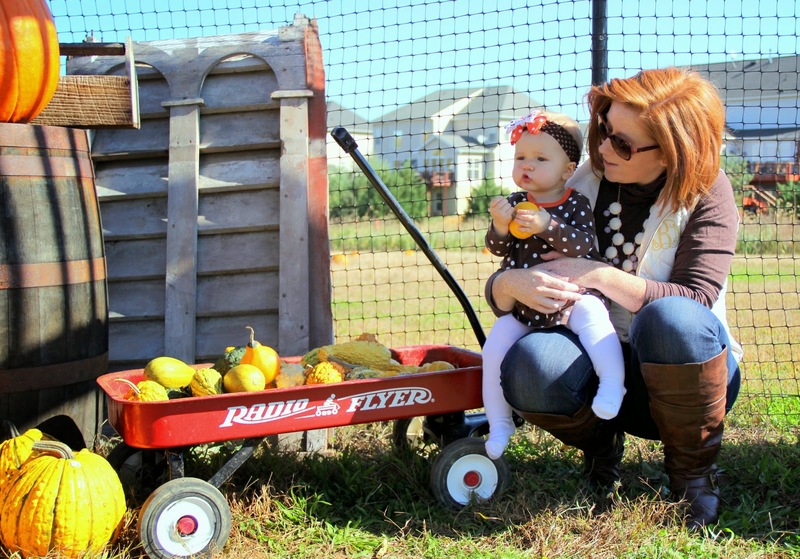 Who's ready to bust out that fall wardrobe? I know I am! You hear me say it every year, but this is truly my favorite time of the year for so many reasons. The weather, the holidays, the clothes, these are just a few reasons why this time of year makes me giddy. 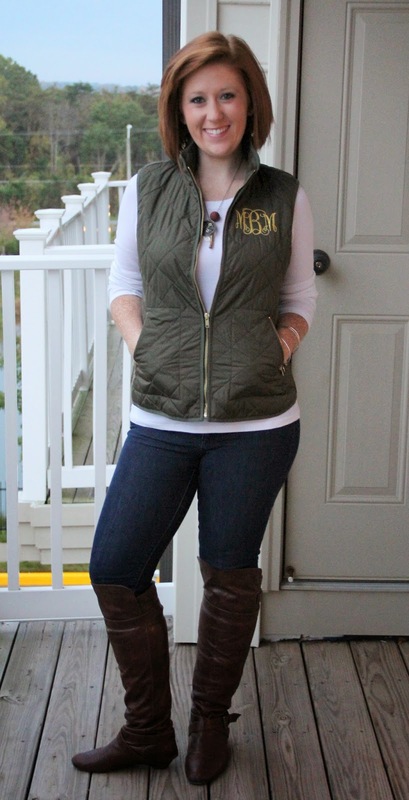 Speaking of clothes, how cute are these Old navy vests?! As soon as I saw these with their adorable gold zippers, I just knew I had to have one (or 2). 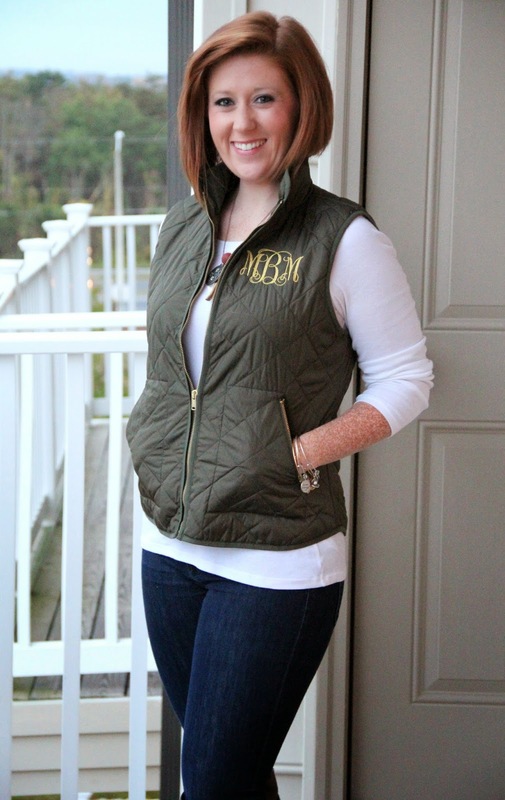 And once I got these bad boys home, I slapped on a gold monogram and voila, my most favorite wardrobe piece was born! I don't normally buy things in this color, but I decided that I needed to try something other than my standard red, pink and blue. I'm kinda diggin' the green and find it super easy to incorporate into my current wardrobe. For this outfit I kept it simple and paired it with boots, jeans and a white tee. So there you have it, my new essential wardrobe piece; the quilted vest. I will be posting these vests for sale on my Instagram account this weekend only. Sizes, colors and quantities are limited, so be sure your following for all the latest sale updates. They will be $45 monogrammed and shipped. I wish I could say I was this creative and came up with this idea on my own, however, that would be a lie. Amanda over at Dixie Delights shared this adorable DIY last month and as soon as I saw it, I just had to try it out for myself! Imagine all the possibilities! 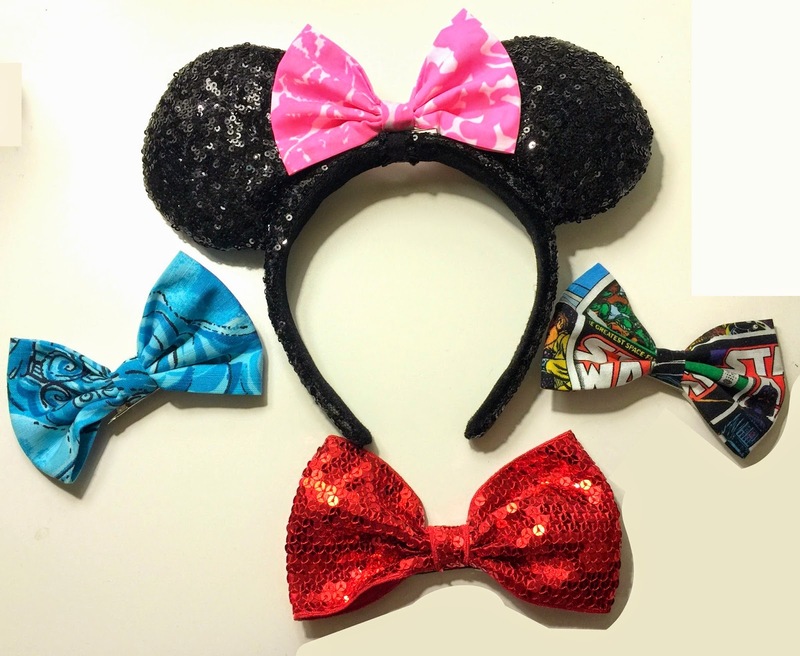 To start, you just need a set of Minnie Mouse ears (I went with the classic ones you can get in the parks), some elastic, alligator clips and any bow you want. This project takes no skill or time so dust off those mouse ears before your next trip to Disney! First you want to carefully cut off the original bow that came on your ears. Don't worry though because you will be able to have the classic Minnie look again by using this same bow whenever you like. Now you need to glue your elastic to the headband where the bow once was. You'll want to glue on the underside so the top can be where your new bows will attach. Now that your elastic is secured to the headband, go ahead and make your bows using your favorite fabric. For mine. I used Lilly and Star Wars (perfect for Star Wars the Weekend) fabric, but this is where you can have fun. Get creative and find fabrics that coordinate with your Disney Park outfits (what, you don't have a separate wardrobe for your Disney trips?). You can even find holiday themed fabrics if you're planning on being in Disney for Halloween, Christmas or New Years. Once you've settled on a bow, or four, simply take your alligator clip and slide it under the center piece of the bow at the bottom. Normally you would attach your alligator clip to the backside of the bow, but for this project you want it on the bottom. And there you have it! Slide it in to the elastic and now your bows are interchangeable! Make sure you put an alligator clip on the original bow as well so you can still wear them the classic way! Below are all the ones I've made so far. I've decided that I need to make bigger bows, but I didn't have any big enough pieces of scrap fabric, so for now these will do, but be prepared to see some real obnoxious ones! I now have ears for every outfit and occasion! I seriously can't contain my excitement. Imagine all the different Minnie ears I'm going to have on my next trip in December! What do you think? If you have a trip coming up, will you do this for you and your family? Let me start by saying these aren't the best pictures. Now that Charlotte is mobile and truly has a mind of her own, getting her to sit still is next to impossible. Good thing we only have to do this three more times! 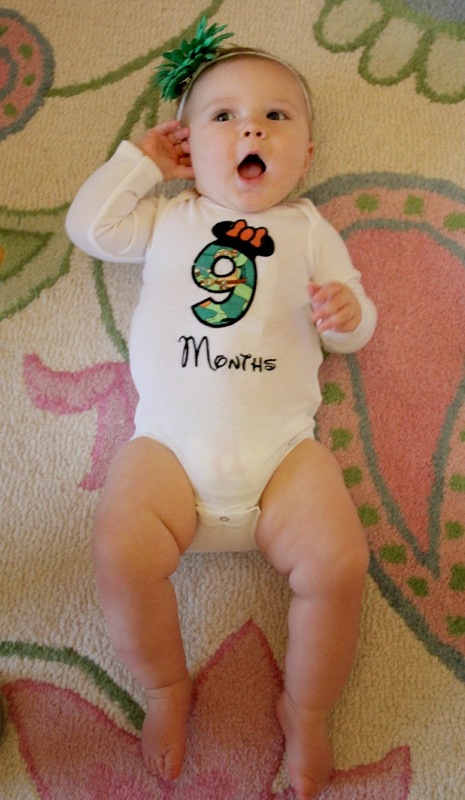 Physically I don't think she's changed that month, but developmentally she has grown so much in just one short month! Eating: Charlotte is still such a good eater. She will eat anything we give her and only makes a face when she's trying a food for the first time. She still likes it, just unsure at first. We introduced meat to her this month and just like everything else, she loves it! Although she primarily eats pureed baby food, we are starting to give her real food since she has plenty of teeth to break it all down. Sleeping: Nothing really new to report on this front. We are still so grateful that she sleeps as well as she does. And now that the sun comes up later, so does Charlotte! I feel bad on the weekends because we won't wake up until 8 or 8:30 because she's so quiet. She'll just sit in her crib talking to herself until we come and get her. We finally have a little weekend routine where she goes down for a nap between 9 and 9:30 and will sleep for a few hours. This is when we get all the stuff around the house done! 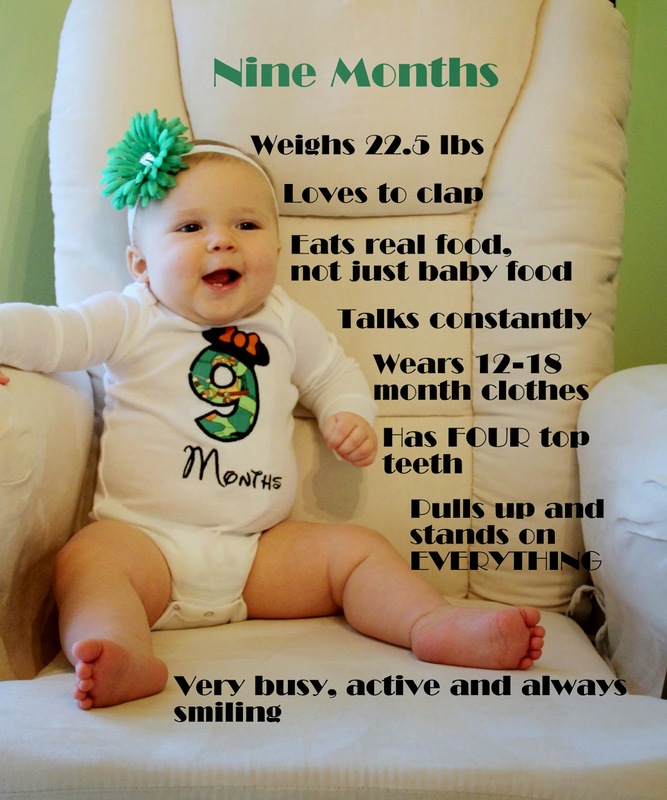 So many milestones this month! Charlotte can now pull herself up on just about anything. She loves to stand while holding on, although a few times I've caught her standing by herself and before she loses her balance, she will slowly squat down to sitting on the floor. She gets into everything which has brought on a new challenge; baby proofing! Now that she has teeth we hear all sorts of new noises from her, but my favorite is when she's playing and starts whispering like she has something super important to tell you. She loves remotes and any unconventional toy, and does not like when we take things away from her. She only cries when she's tired or hungry, which makes for such a pleasant baby the rest of the time! 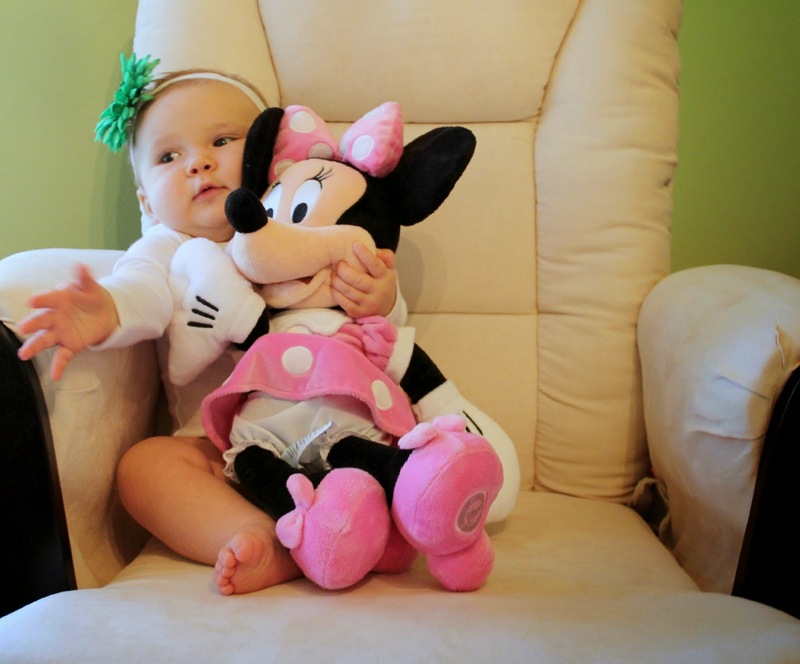 We are no longer concerned about Minnie Mouse, in fact you could say we are best friends now! I think we have gotten over the stranger danger issue. She doesn't instantly melt down and go into hysterics when she sees a man. Now she is just a little apprehensive which I'll take any day over the breakdown we used to have. I can't wait to celebrate the holiday season with her while she is at such a fun age. These next three months are going to fly by, but be so much fun! High Five for Friday - Back for Real This Time! I really appreciate all the emails and texts asking if everything is ok because I haven't blogged in so long. Everything is perfect! I've just been focusing on trying to keep a healthy balance of work, blogging, embroidering and family. And when doing so, I found that blogging was the one thing that wasn't making the cut every day. Plus, I didn't have any new tutorials, outfits or fun updates to share since my focus was keeping my head above water. Now that that's out of the way, let's talk about this past week! My mom went to a quilt show and grabbed some treats for me! It may look boring to you, but this is gold in my house. Sticky stabilizer, 14 spools of thread and a spool holder for the larger spools. This past week I was in Baltimore for work and this was the view from the hotel! Too bad the Oriole's didn't play while I was there. Charlotte loves running around the house while sitting on Daddy's shoulders. It's so fun to watch the two of them play! Saturday was an impromptu girls day where Charlotte and I met my friend and her daughter for lunch. Charlotte enjoyed herself, even though she looks unimpressed in this picture. Thanks for sticking around during my crazy month of no blogging. 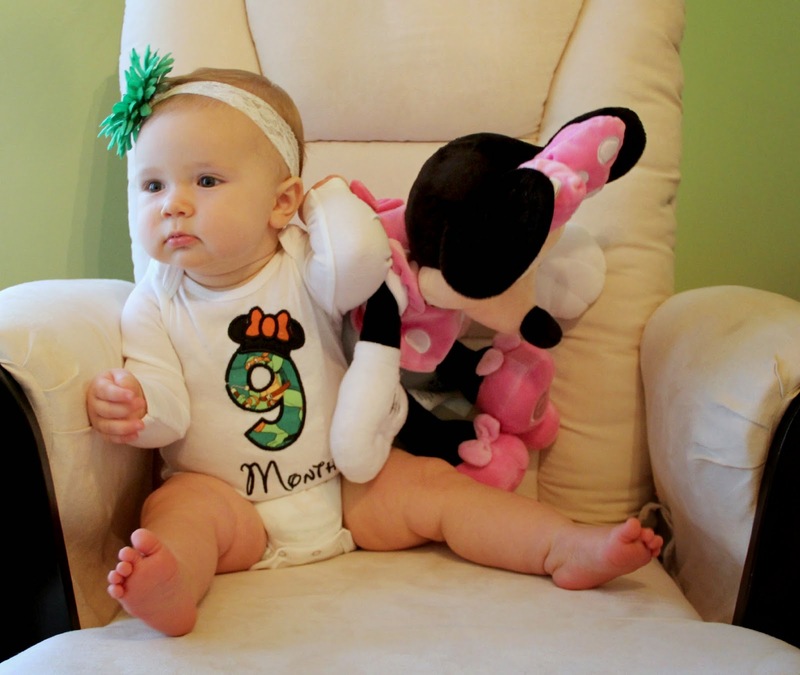 I promise to be back in full swing with Charlotte's 9 month update on Monday!